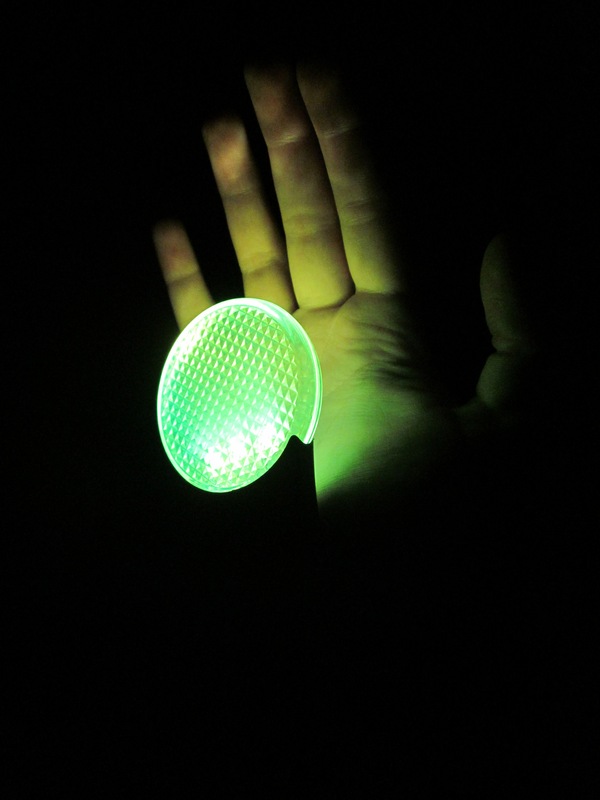 In this lesson, high school students perform everyday movements while wearing LED light bracelets on their wrists and ankles. 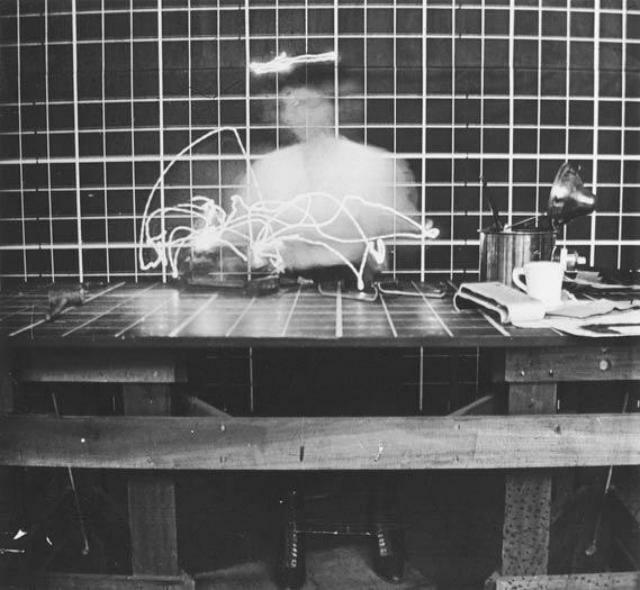 Their motion is recorded through long exposure photography, which, when combined with light painting, can reveal subtleties in human movements too fast or complex for the naked eye to discern. The above image is a student performing an overhand volleyball serve. 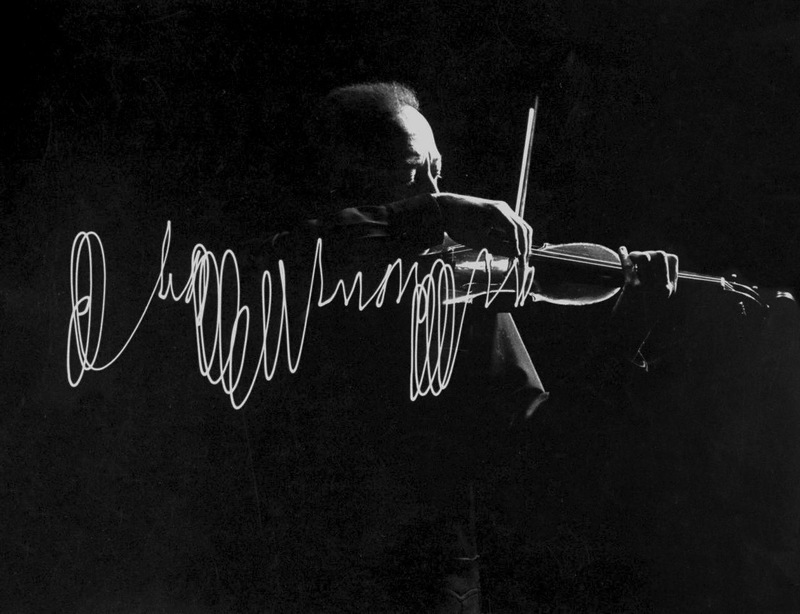 This lesson was inspired by artists Gjon Mili and Buzzy Sullivan. To teach this lesson, you will need: a camera with a long exposure setting (at least 8 seconds), multiple LED lights that can be worn like bracelets (try attaching a light to a rubber band), a pitch black classroom (see if you can find a classroom, gymnasium, or storage area with no windows), and five 40-minute periods of your time. Essential Questions: What do our everyday movements really look like? 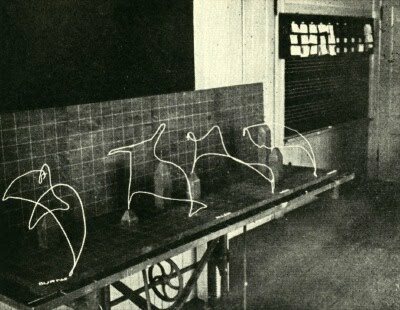 If three people perform the same movement, will it look the same or different? What does our body language say about us? Does what we do equal who we are? Photography is like Braille for people with vision, an art form that enlightens our senses to the subtle perceptions to which we are otherwise blind…. 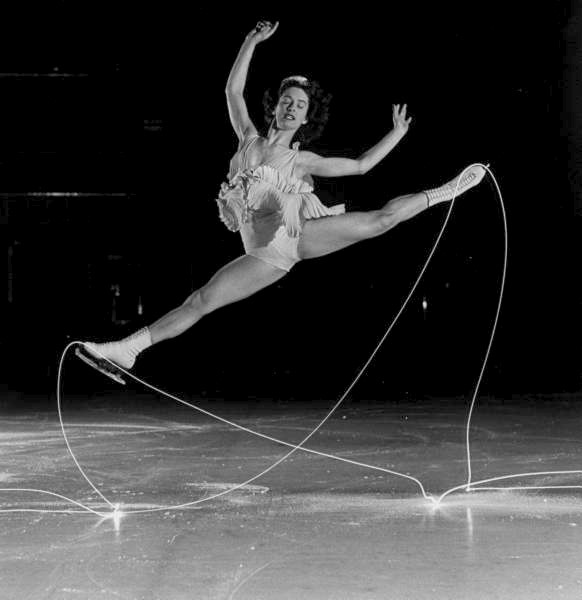 The use of long shutter speeds in the making of these images allowed me to explore the nuances of movement and capture the DNA strand of each trick as it is being performed. Students may immediately comprehend what a long exposure is after being shown images like these: Ask them these questions before revealing the answers: (1) what they think this photo is of, and (2) how do you think an image like this could be made/what would a camera have to do to be able to take this photo? 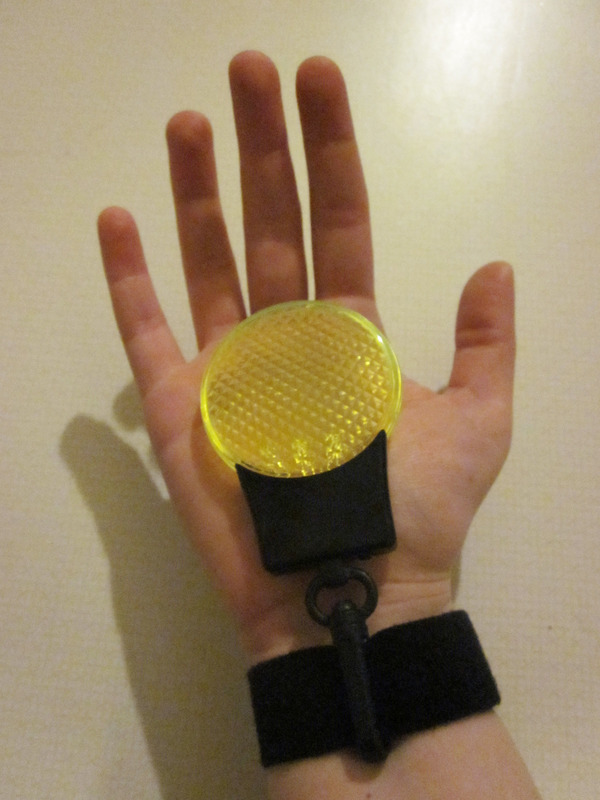 Ask them questions like these before revealing the answers: What do you think this photo is of? What is are the red streaks vs. the yellow streaks? How do you think an image like this could be made?/What would a camera have to do to be able to take this photo? Spend the first two days of the lesson introducing the reference artists and completing the worksheets. 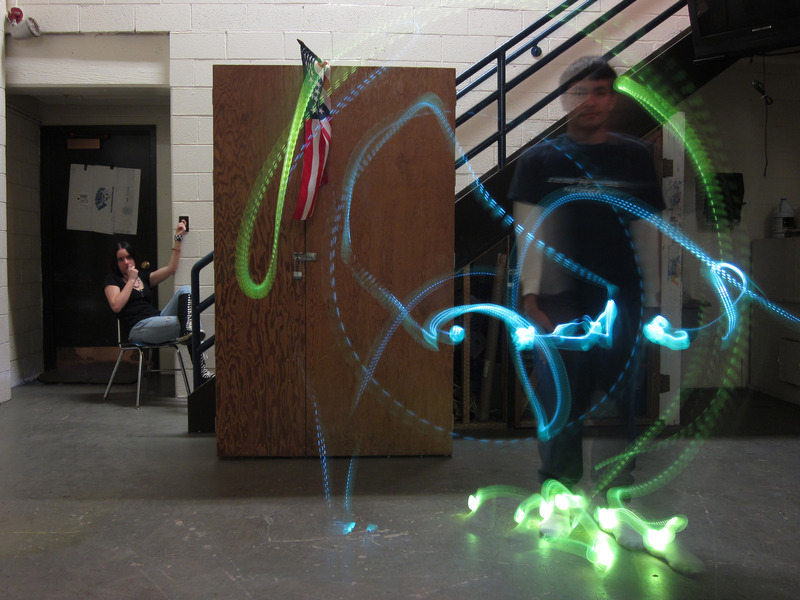 It would also help to do an in-class demonstration of how the students will be making their light paintings. 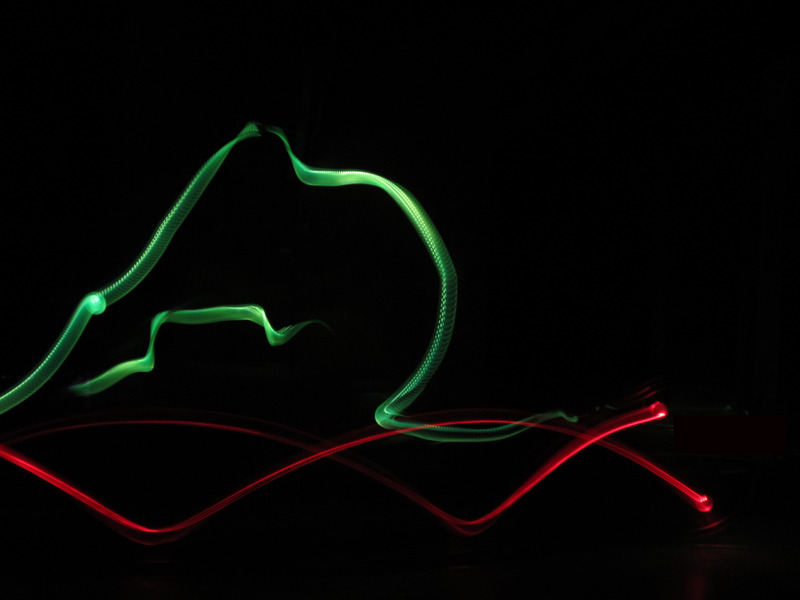 On the third and fourth day, hold class in the windowless room, and have students perform their light paintings one by one. On the fifth day, show the class a slideshow of their work and have them reflect on the process. 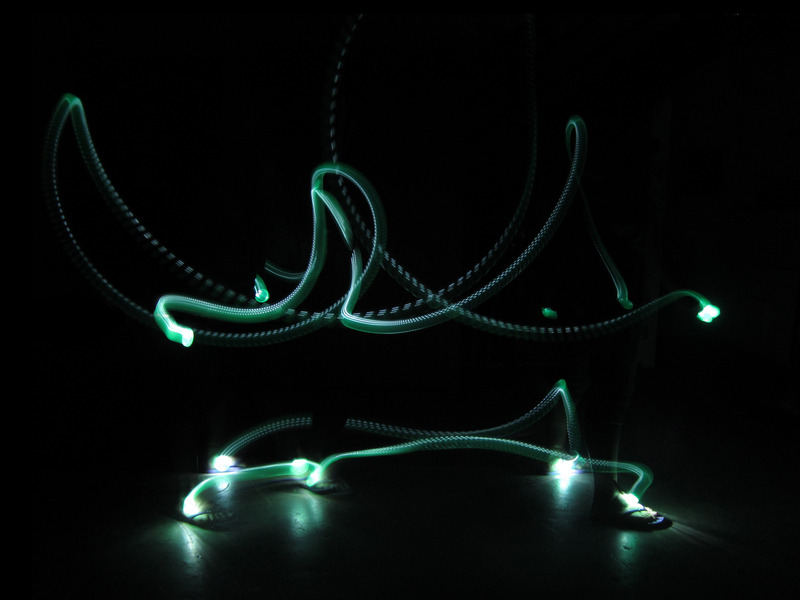 These are the lights that my students used to make their light paintings. I found these LEDs for $1.00 at a Chicagoland Dollar Tree, and eventually attached them to rubber bands instead of the expensive Velcro straps pictured below. Notice how each circular light actually has three LEDs inside of them – this offers the final photographs more variety in line quality. 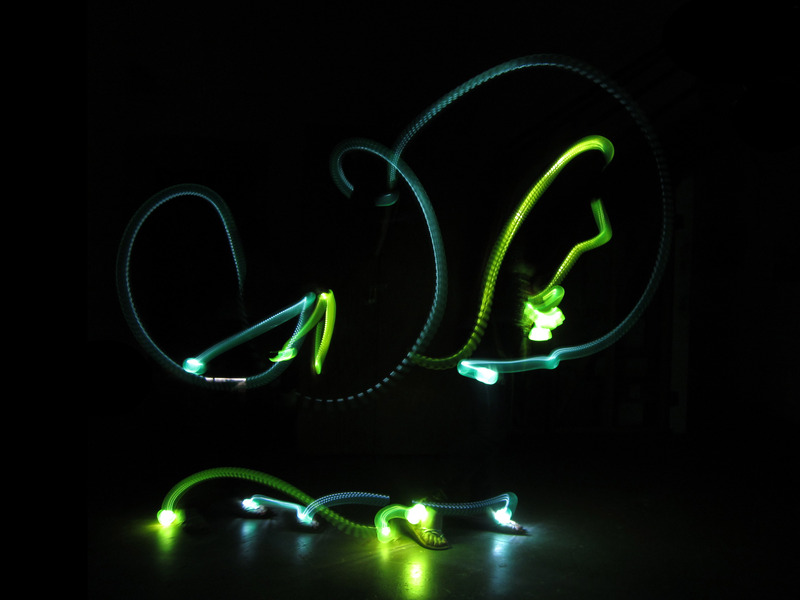 You can use anything that emits light to make a light painting. 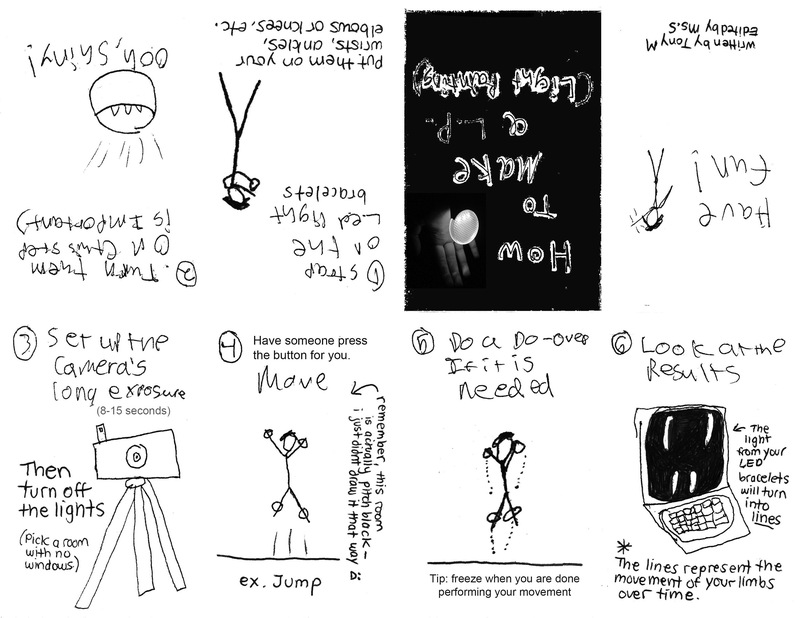 Here’s a worksheet that can help students choose what movement they will perform. I have had students walk, dance, comb their hair, cook, play soccer, football, basketball, baseball, and volleyball, do colorguard, cheerleading, and karate moves, bowl, play piano, text, exercise, play peekaboo with their son, fish, etc. 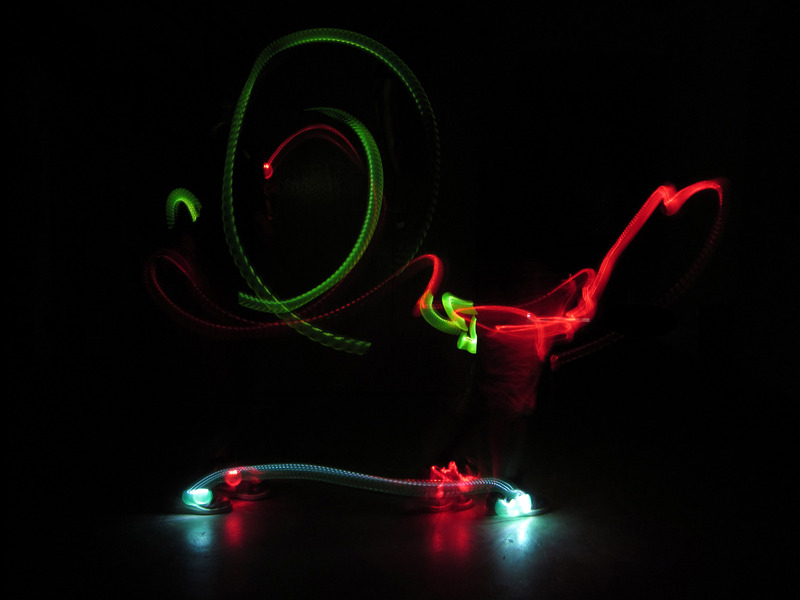 If some students are discouraged, viewing themselves as not very active or as not having many special talents to perform in their light paintings, show them some light paintings of “boring” movements like walking (below). They’re still spectacular. 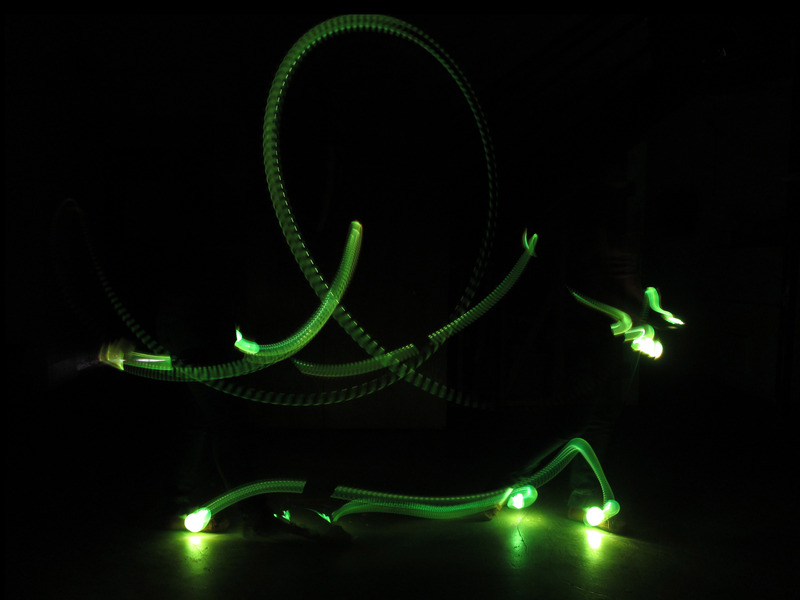 Light-painting reveal the fascinating subtleties of even the most basic movements. 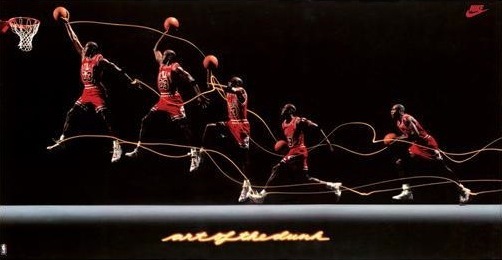 Note at the bottom of the worksheet that it may be helpful to have students break down a larger movement or idea (basketball) into smaller pieces that they can choose from to focus their light-painting performance on (dribbling, passing, shooting, etc.). Or maybe a group of students can try to record every movement of a whole game of basketball, by assigning a different smaller chunk to each student! The possibilities are endless. It is a total visual experience that combines lines, movement, color, and forms. [Having] the [overhead] lights off make[s] one work the mind to think of what is actually going on in the painting. It makes you wonder if [movement] differs with real life in the light and life in the dark…and what we would look like if we all moved [that] fast. When you show students their final photographs, it will be very hard to recognize which photo is which. You could take advantage of this and have the photos next to a list of every movement that class performed. Can they figure out which light painting is which movement? Have them consider what they would need to do with their arms and legs to do that movement–what shapes would their limbs create as they moved? 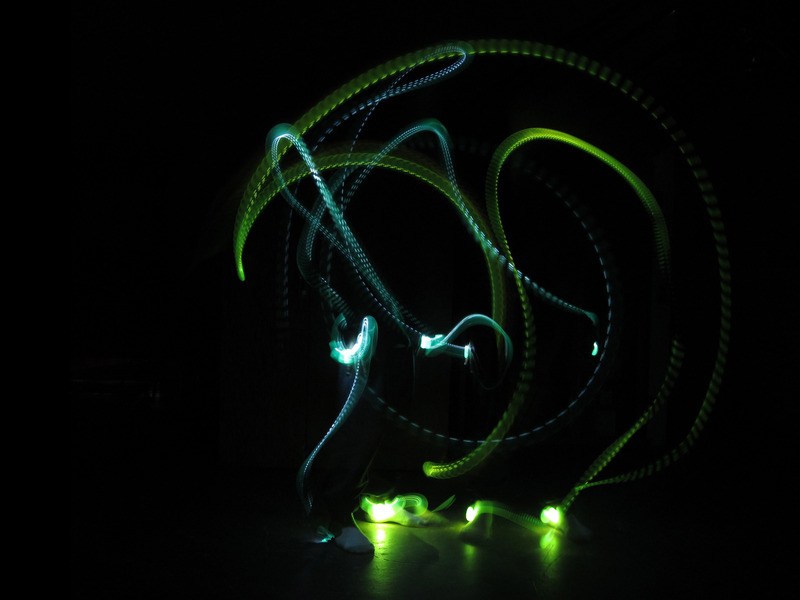 Or do the reverse–look at the light painting, try to figure out which line represents which wrist or ankle, and then try to decode the movement with their own bodies in class–does it look like anything that people recognize? When the student who’s in the photograph finally recognizes it as their movement, it’s a special moment. Try to show these images big, perhaps using a projector. (Also note that this looks great at a student art show.) If you have the budget, it also looks great to print these out, and then to have students practice their matting and exact-knife skills. Objectives: Students will: 1. Identify a significant movement that they perform everyday which they are able to perform (or mime) in a classroom setting. 2. On a black piece of construction paper, draw a prediction of how they think their light painting will turn out. 3. 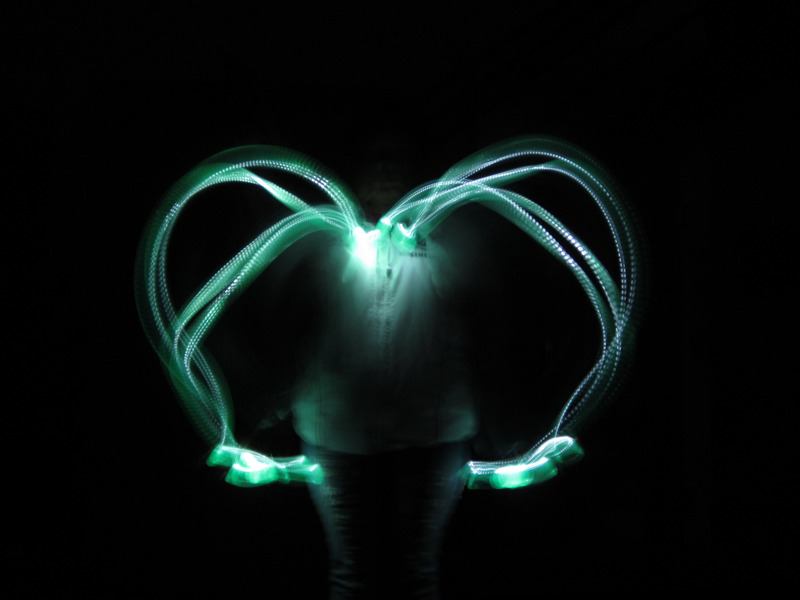 Perform their movement in front of their classmates in a dark room while a long exposure photograph is taken. State Standards: 26.A.5 Analyze and evaluate how the choice of media, tools, technologies and processes support and influence the communication of ideas. 25.B.5 Understand how different art forms combine to create an interdisciplinary work (e.g., musical theatre, opera or cinematography). 26.B.5 Create and perform a complex work of art using a variety of techniques, technolo­gies and resources and independent decision making. Literacy: Students will fill in a worksheet by reading and writing, and complete a written reflection on their light painting experience. 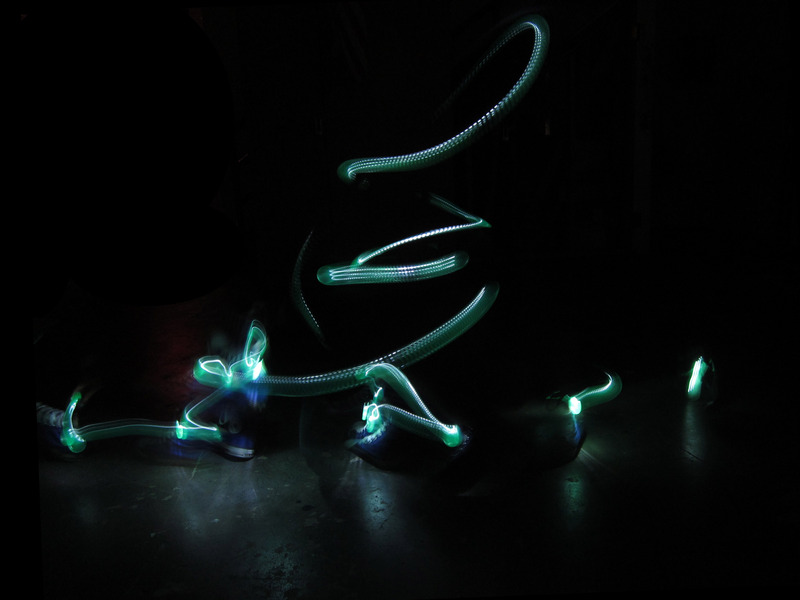 Additionally, students will be encouraged to write a zine explaining how to make a light painting. Adaptations: Students with disabilities need not worry about “being able to perform”- this lesson is about choosing a movement that they perform everyday! 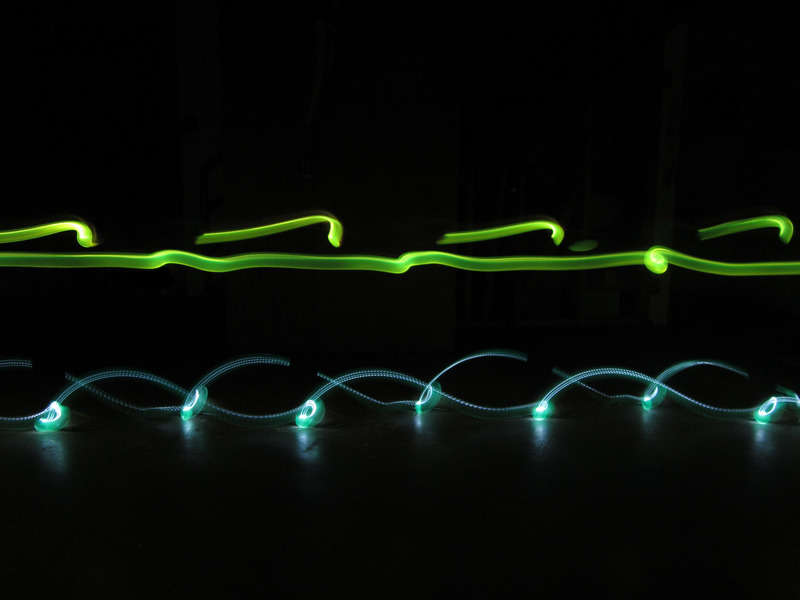 When one of my students in a wheelchair performed his “shooting a basketball” light painting, we attached lights to his wheels.